Stretching, even just a little, can do wonders for your body and mind. Sitting hunched over all day means stretching is extra important. What are some quick and easy stretches for the office? Read on to find out more. If you work in an office chances are you spend the majority of your time sitting at a desk. So if you work full time you probably spend at least 8 hours a day and 40 hours a week sitting. Sure there are the trips to the water cooler or the break room but you probably sit on the drive to and from work and later on when you get home to relax. So that really adds up. Sitting all day can take a toll on your body so it is important to get exercise and stretch. We have some great stretches you can do at the office right at your desk! Stretching will give you a boost of energy, increase circulation and blood flow and increase flexibility! This is pretty simple. Just interlock your fingers then raise your arms above your head. Push your hands as far away as possible. This is great when you are feeling a little tired or stiff. Do you spend all day in front of a computer? Are you fingers always on the keyboard? If so, you can greatly benefit from a simple wrist stretch. For this one, stand up and place your hand on your desk so that your wrists are facing away from your body. Apply pressure until you feel a nice stretch, hold it for a few seconds then release. Follow up with a few wrist circles and repeat. Sitting at a desk all day can cause our shoulders to hunch and lead to strain of the cervical spine and shoulders. For a nice neck and shoulder stretch, reach your arms behind your back and interlock your fingers. Begin lifting your arms behind you until you feel the stretch in your chest and shoulders. If you don’t always sit properly (and let’s face it, most of us don’t) you can be reducing your blood circulation, especially in your legs. To increase circulation to your legs and lower half, remain sitting and extend your legs out straight in front of you so that your heels are still on the ground. Then reach your hands toward your toes, just as far as your body will allow, so that you get a nice stretch. This will help keep that blood flowing. Try squeezing a stress ball a few times. This will help reduce stress and tension while increasing mobility to your hands and forearms. It is important to maintain flexibility in the hips. Hip replacements are not fun! For this stretch, sit in the middle of your chair with your feet flat on the ground. Then, take one ankle and place it on the opposite knee and sit up straight. If you don’t feel the stretch, simply keep your back straight and then begin to tilt forward from the waist. You should feel a nice stretch in the hip of the foot that is raised. Hold for a few seconds and repeat on the other side. Back pain is a common symptom of the desk jockey. Stretching your back and spin will alleviate pain and keep you flexible. For this stretch, remain seated with your feet together and flat on the floor. Next, place your left hand on your right knee and twist your entire torso to the right. Sit up straight and tall and look behind your shoulder. Hold the position for a few seconds and then repeat on the other side. Sitting all day longs reduces your mobility and balance. This thigh stretch helps to promote strong legs, flexibility, and balance. Start by standing up near your desk. Place one hand on your desk for support. Raise one leg behind you and grab hold of your ankle (or you can grab your shin if you can’t reach your ankle). Lift your left leg as high as you can with your knee bent at a right angle. Hold the stretch for a few minutes then repeat on the other side. It is important to take the time to take care of yourself. Stretching helps relieve stress, increase blood flow and flexibility and prevent injury. It is also important to take care of your living environment. 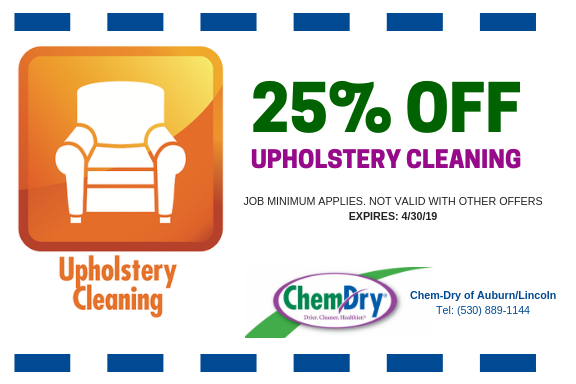 Carpet, rugs, and upholstered furniture experience a lot of wear and tear over the years. Oils from hands and feet, dirt, dust, and stains all contribute to a worn out look and smell. 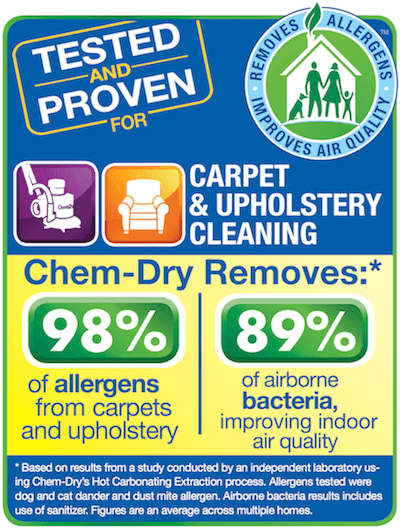 Dust and dirt in carpets, rugs and furniture is not good for the health of you or your family. 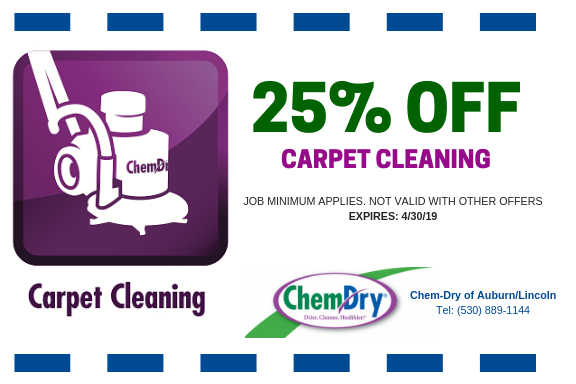 It is important to make sure that you vacuum them regularly and have them professionally cleaned at least once a year. 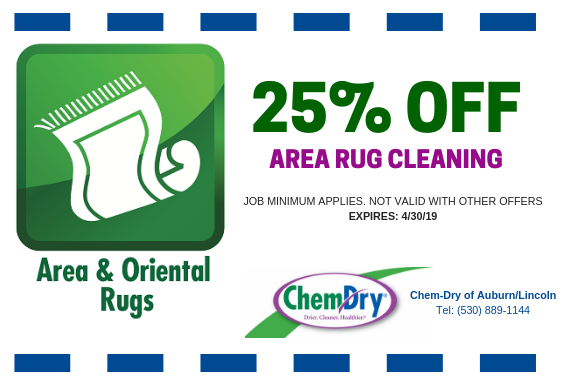 Chem-Dry of Auburn/Lincoln provide professional deep carpet, rug, and upholstery cleaning. Our cleaning solution The Natural is eco-friendly and green-certified so it is safe for your family. We use the most innovative equipment with the power of carbonation to lift and remove dirt, dust, oils, and stains.